Preparation time: 10 minutes (includes heating time). Combine sugar, cocoa, cornstarch, and instant coffee in a medium saucepan. Gradually stir in the milk. Bring the mixture to a boil over medium heat, stirring constantly, until it thickens. Remove from heat and stir in margarine and vanilla; keep stirring until margarine is melted. 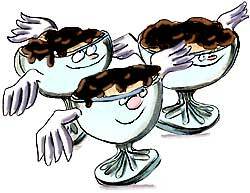 To serve, scoop 1/2 cup frozen yogurt into individual serving bowls, and top evenly with hot fudge sauce. Serving size: 1 sundae (1/2 cup frozen yogurt with about 2 tablespoons sauce). Exchanges per serving: 2 starch, 1/2 fruit. Carbohydrate choices: 1/2.